Your wedding gown undoubtedly makes the most striking visual statement. Browse through our wedding store for ideas. Do you see yourself as traditional or ethereal and Boho? Picture yourself wearing your dream wedding gown. When you upload your photo to our dressing room, you can do just that! Our AI technology lets you see yourself wearing the wedding dresses of your choice. The more gowns you try on, the more similar ones we can provide. 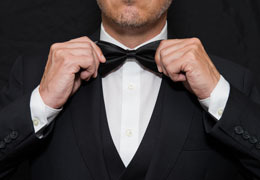 We also have tuxes for the groom. 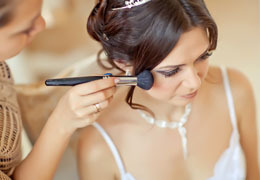 Of course, you want your wedding hair and makeup as flawless as your gown. Our hair and makeup artists will make you look like a princess. Click through our selection of stylists and makeup artists for that perfect wedding look. The great news is that with your uploaded photo, you can see yourself wearing any hairstyle before making a decision. Your wedding ring is the visual symbol of eternal love you’ll be wearing for the rest of your life. It’s a simple round band, yet there are so many styles from which to choose. Our selection of wedding jewelers can help you narrow your choice. You’ll find a wide array of wedding ring styles from major retailers such as Amazon at our Wedding Store. Personal shopping at its finest. ##With all these choices, choosing the right ring can be overwhelming. Do you go with diamonds or another gem? Platinum or gold? No need to panic, because the metals don’t have to match. 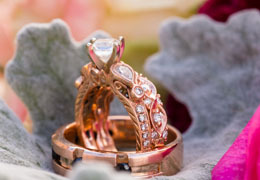 This is where a trusted wedding jeweler can be your best friend. ##You will be wearing your engagement and wedding rings for a lifetime. Look for bands that work together. A good combination is to opt for a simple wedding band if the engagement ring is elaborate, and a more crafted design for the wedding ring if the engagement ring has a plain design. ##Also, consider your lifestyle. If you work with your hands a lot, the simpler your wedding ring, the happier and more comfortable you will be in the long run.